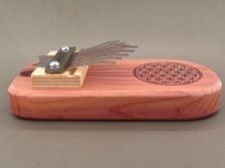 Richly aromatic and beautifully grained cedar wood is the base for this ages old folk percussion instrument. 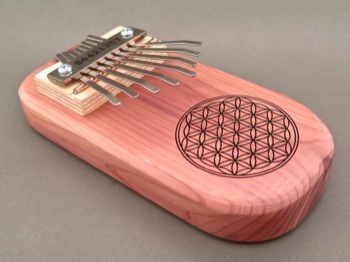 Arranged in a diatonic 8 note scale, this handmade kalimba comes complete with a songbook of 28 easy to learn songs. It also displays a harmoniously proportioned flower of life design. This geometric pattern of overlapping circles is centuries old and found in many major religions. It is considered an important and sacred pattern of creation and the universe. 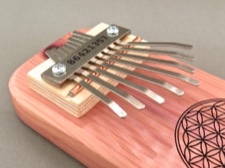 The Kalimba measures 6 inches long, 2.75 inches wide, and is 1.5 inches high.